Germany is no stranger to the top division of the IIHF Women’s World Championship, or even to having success at that level. Back in 2017, the Germans took the World Championship by surprise, advancing past Russia in the quarterfinals by a score of 2-1 and playing in the semifinal round for the first time. They finished in fourth place, the highest finish ever for Germany at the top level. But the Germans have also had some trouble consistently avoiding relegation, and missed out on the 2018 Olympics after failing to qualify for the tournament. It was a tougher field to make, with the lower-ranked joint Korea team taking a crucial spot in the eight-team tournament as Olympic hosts. The German federation has made it clear that they want to avoid the same result in 2022, and making the cut for the Olympics is absolutely the priority. On Thursday, Germany will start off the first World Championship of the new Olympic quad with a new face behind the bench. 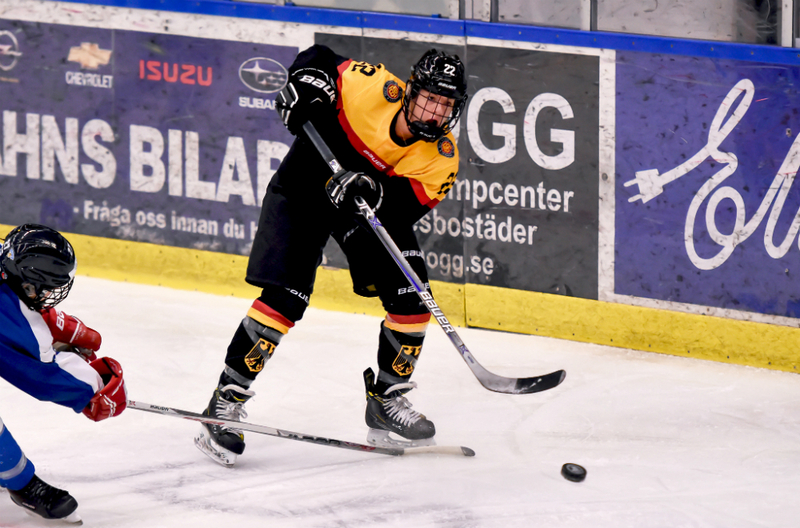 Head coach Christian Künast took over for Benjamin Hinterstocker midway through the year, and his biggest goal for the team is to instill more assertion and a stronger belief in every player on Team Germany. The first step towards achieving that, according to Künast, is getting his team to play a more aggressive, confident style. “I just can talk about what I’ve seen from the last year on videos, and so they sit back a lot and wait and wait and react, and my style is to be active and don’t react, go,” he said. “They are really afraid of mistakes and that will happen, but I want them so that they go. That’s the basic word, ‘go’. I want them so they don’t sit back, they go, be aggressive; we want to force plays and that’s our basic mentality. Before taking over as the women’s national team head coach, Künast was the head coach of the German men’s under-20 team; he led them to a first-place finish at the 2019 Division I World Junior Championship, and they earned a promotion to the top level for the 2020 tournament. Last season, Künast was an assistant coach with Germany’s men’s national team, and helped orchestrate one of the most fun hockey stories we’ve seen in a while: a surprise silver medal finish at the 2018 Olympics. When he was first approached about the women’s national team job, he was hesitant to take it because he was committed to the plan and the culture he was building with the men’s U20 team. But Künast came to realize that coaching the women’s national team presented a more lucrative opportunity. As a coach on the men’s side of things, Künast was part of a major effort to establish the same structure and system throughout the national team program, from the senior team on down to the under-16 team. He wants to do the same on the women’s side, and believes that is the key to long-term success. “The men’s team down to the U16, they play the same system, they have the same style of practice, there’s the same drills, the same systems stuff on D zone, on forecheck, on breakouts. And so that’s the same that I want to do now with the women’s,” he said. “But I have to start with the basics. I have a plan of what I want to do over the years, but now, for just now, it’s important to bring the team together for the World Championship. After that, I have my plan for what I want with the women’s, what I want with the U18 women’s team, what I want for the U16 women’s team. So there will be one plan for all three teams, but a little bit easier for the U16s, a little bit harder for the U18s, and hardest with the women’s. Künast did have an opportunity to get behind the bench with the women’s national team at a tournament in Russia in February, where Germany went up against the Czech Republic, Finland, Russia, Sweden, and Switzerland. As can be expected, there were some things he really liked about the team’s play there, and some things he wants to change. Part of changing that attitude is getting the players to understand how good they really are, which Künast plans on addressing immediately as the new head coach. Before the tournament even begins, the Germans have some adversity to face. Veteran defender Tanja Eisenschmid, a major presence on the blue line, is out with an injury. Künast says it will take a team effort to replace her, but it’s not an impossible task. He also isn’t looking for just one player to step up and score this tournament. His biggest philosophy as a coach is that it’s all about the team, and getting each and every player to understand that they can make an impact with every shift. Again, it will take a little belief.